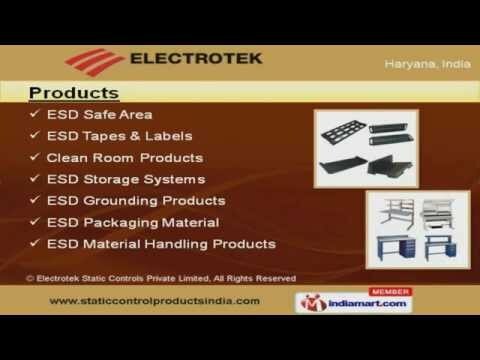 Welcome to Electrotek Static Controls Private Limited. Manufacturer and Exporter of a Wide Range of ESD Products. We are an ISO 9001:2000 and GMP certified company, established in the year 2008. Our Products testedas per the SGS ROHS Specifications and we have received the export status of trading house. Latest manufacturing technologies, robust infrastructure and Timely delivery of consignments make usthe first choice of our clients. We offer a diverse range of Clean Room Products, ESD Safe Area and Storage Systems. Our ESD Safe Area is a class apart. ESD Grounding Products offered by us are widely acclaimed in the market. We are offering a top notch quality range of Clean Room Products that are cost effective. Our ESD Packaging Materials are in huge demand across the global markets. ESD Material Handling Products are appreciated amongst our clients for superior quality.